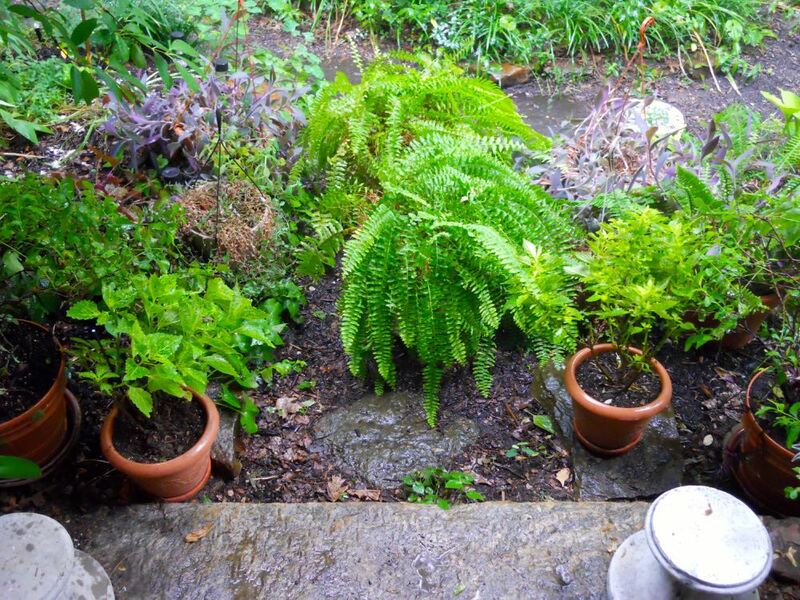 Give inside and deck plants a good rain shower or two during very hot spells. 1. Water plants at root level, which means no sprinklers. Use underground wands and move them to saturate soil. Gardens need an inch of rain a week. Don’t forget established shrubs and older trees, they also need moisture delivered to their roots to make sure they make it through the record hot August temperatures. 2. Water potted plants daily; if temperatures are once again hitting record levels, maybe twice a day and move them into shade. Add compost to keep the potted soil healthy. 3. If you didn’t get to planting your garden this year, at least toss a few buckwheat seeds to help improve your soil. Buckwheat will sprout in about 6 weeks and will be welcome fall food for pollinators as well. 4. If you haven’t been using your fresh herbs, this is a good time to start. Most may have flowered and lost some of their potency but they still can be added to salads and other summer dishes. Rosemary and chamomile can be harvested and used in bloom. I chop up and freeze some of mine in ice cubes for winter use in soups. Irregular watering contributes to tomatoes cracking. They're still good, they just look odd! 5. My tomatoes set late this year but they are finally ripening. Try to keep them evenly watered to minimize cracking. 6. Have peonies you want to divide? Wait until after a good rain but you can start dividing them now through September. Bury the root “eyes” no more than an inch or two beneath the soil; if you bury them deeper the plants won’t flower. If you have to move peonies without rain, use a hose to soak the soil around the plant before you try to dig it up. 7. You can also dig up daylilies and iris now to divide and re-plant. Again I would wait until after a good rain. If you still need to move them, at least water the area with a hose first so you don’t rip roots when you try to dig them up. 8. Start saving seeds for next year. Marigolds, zinnias and sunflowers have a lot of seeds than can easily be stored. 9. I am also developing new flower beds for next year by removing starts, adding cardboard and mulching. 10. Hot temperatures can prompt trees to drop leaves early. Leave leaves on the ground to return nitrogen to the soil. If you are worried about them sitting on grass, set your mower to a higher setting and cut them up when you mow. Leaves are a wonderful source of soil amendments. They also work well as mulch, helping to retain water when leaves are underground or under mulch. In hot weather, the best way to water your garden is with an underground wand (back) or by pressing the hose head into the ground so the water reaches plant roots. 7. You can also dig up daylilies and iris now to divide and re-plant. Again I would wait until after a good rain. Remember to use gardening gloves so your hands don't get cracked. If you still need to move the plants, at least water the area with a hose first so you don’t rip roots when you try to dig them up. These Black-eyed Susans have settled in well with the help of wet leaves under mulch.